ASMOSIA’s mission is to promote the exchange among its members in all fields related to the study of marble and other stones of art historical or archaeological interest. This exchange is accomplished through electronic communications, biannual meetings of the membership, and publication of the meeting proceedings. Site of the ASMOSIA XII Announced! The Executive Committee of ASMOSIA together with the Organizing Committee has the pleasure of inviting scholars to participate in the XIIth International Conference of the Association, which will be held in Izmir, Turkey. The Conference will deal with various fields of research on stone promoted by ASMOSIA with the aim of creating an interdisciplinary discussion, which should include contributions reflecting different scientific and archaeological approaches. The faculty of Engineering, Dokuz Eylül University organized the ASMOSIA XII International Congress in Izmir, Turkey on 10-14, October 2018. The conference was housed at the DESEM Conference Centre inside the Rectorate Building of Dokuz Eylül University. It has been over two years since our last gathering at Split in Croatia where Katja Marasović and her efficient colleagues organized the splendid ASMOSIA XI conference on 18-22 May 2015. Applications to Specific Archaeological Questions – Use of Marble. Provenance Identification II: (Other Stones). Advances in Provenance Techniques, Methodologies and Databases. Quarries and Geology: (Quarrying Techniques, Organization, Transport of Stones, New Quarries, Stone Carving and Dressing, Hazards to and Preservation of Quarries). Stone Properties, Weathering Effects and Restoration, as related to diagnosis problems, matching of stone fragments and authenticity. And a Special Theme Session on: The use of marble and limestone in the Adriatic basin in Antiquity. Interesting new research on the association of newly and older discovered marble and limestone quarries with specific monuments all over Europe were presented. More detailed description and data on quarries, new techniques for analyzing the marble crystals, combined methodologies for the provenance of marble and tackling of archaeological and art historical questions made this meeting very stimulating. The Poster Sessions attracted special interest as they were given plenty of dedicated time for reading and discussing the papers with the authors. Students competed for the two prizes given by ASMOSIA on the name of Norman Herz for best student posters. The 1st prize was awarded to Mrs. Natalia Toma for her poster on “Aphrodisias and the regional marble trade. The case of the Scaenae frons of the theatre at Nysa”. The 2nd prize was awarded to Mr. Hernando Royo for his poster on “White and grey marbles in Roman and late Antiquity times in the province of Toledo (Spain). Archaeometric Characterization”. Co-authors were Anna de Mesa and Mauro Brilli. The conference included a wonderful afternoon tour in the Diocletian Palace and an exquisite conference banquet with Music at the Split City Museum. It was followed by a post conference excursion to the beautiful Brač island where among the picturesque landscape we visited the very interesting museum and the roman limestone quarries from which the Palace and other monuments in Split were built. The ASMOSIA membership business meeting took place in the final afternoon during the conference. We paid special tribute to two distinguished members of ASMOSIA who passed away during the previous year. Norman Herz, a historical figure and one of the founders of ASMOSIA and also its first President (an obituary presented by Scott Pike), and Bruno Turi, a constant participant and past councilor of the EC (obituary presented by Lorenzo Lazzarini). As this was an election meeting, the General Assembly elected Prof. Moshe Fischer as a new Councilor to the EC for a service period of two conferences. Various other matters were discussed in the membership meeting among which the legalization of ASMOSIA in Spain. After the conference very hard work was put towards this aim by our Secretary/Treasurer Pilar Lapuente and a lot of formal papers were prepared, signed and officially stamped by various authorities in Spain and Greece. Lawyers were employed to deal with the legal matters. I am sorry to say that the final result was negative for a number of legal reasons not conforming to the Spanish legislation. I hope to see you all there!. With my warmest wishes for a fruitful year. Professor Emeritus Norman Herz died on May 28, 2013 in Athens, Georgia. Born in Brooklyn, New York, Herz developed his life-long love and making geology relevant in our modern society. Within these pursuits, Herz became an early pioneer in integrating geologic practices and ways of seeing into archaeology. Herz’s first foray into archaeological geology came after he was commissioned as a 2nd lieutenant in the US Army’s Corps of Engineers and Air Force in 1945 and later earned his Ph.D. in Geology from John Hopkins University. Working in Greece in the early 1950s with W. K. Pritchett, Herz recognized that the contemporary methods of marble identification of ancient monuments and statuary were too subjective and often incorrect. From this experience, he set out on a lifetime’s worth of research to develop a quantitative method to distinguish between the different white marble sources from throughout the Mediterranean that were used in antiquity. Upon returning to the United States, Herz was employed by the United States Geologic Survey (USGS) as an economic geologist. Six of those years Herz spent in Brazil where he was a research scientist studying the country’s mineral deposits. Not only did he learn the Portuguese language, he made a significant impact within the Brazilian scientific community. This is reflected by his election in 1981 as a Foreign Associate of the Sao Paolo State Academy of Science followed by his election in 1991 as a Foreign Member of the Brazilian Academy of Sciences. Upon his retirement from the USGS, Herz was hired by the University of Georgia to Chair their Geology Department, a position he held until his retirement in 1992. From the 1970s on, Herz focused on distinguishing the white marble quarries of the Mediterranean. He made numerous trips to Greece, Italy and Turkey to collect a comparative marble database of all the important ancient quarries. He subjected the samples to phsyiochemcial analyses and, building on the preliminary work of the Gales at Oxford, found that the stable isotopes of carbon and oxygen of the complex carbonate ion provided a very good separation between many of the marble types. Herz’s resultant database, first published in 1985, proved very successful at answering many important questions regarding the use, trade and quarrying of this important ancient resource. Herz consulted on numerous projects including studying the marble sources of various temples and monuments at sites such as ancient Olympia, Bassai, the Athenian Agora, and Delos. He worked closely on collections from the British Museum in London, the Ny Carlsberg Glyptotek in Copenhagen, The National Gallery in Washington DC and the Metropolitan Museum of Art in New York. He also performed critical analysis on the famous Getty Kouros. Herz’s work has been published in over 200 articles. With the growing interest in marble studies, in 1988 Herz in collaboration with other founding members, established the Association for the Study of Marbles and Other Stones used in Antiquity (ASMOSIA). Along with his colleague Marc Waelkens, Herz convened a NATO-sponsored Advanced Research Workshop (ARW) in Tuscany, Italy – the first of many ASMOSIA meetings. This was the first ARW devoted to the Archaeological Sciences in the International Scientific Programmes of NATO. ASMOSIA’s success at integrating archaeologists and art historians with geologists and other physical scientists is demonstrated by its 10 international conferences, each producing a published volume that can be found in archaeology and Classics libraries from around the world. Herz was the first President of ASMOSIA and remained at that position until he stepped down in 2000 at which time he was named Honoree President. Herz’s dedication and commitment to archaeology was well recognized. In 1985, the American Journal of Archaeology celebrated its one hundredth anniversary. In a review of the stewardship of Ashton Sanborn as editor, only two articles were cited as “significant events”. One was the aforementioned paper by Herz and Pritchett in 1953 which “raised issues that have continued to be of interest to scholars in many specialties, and only recently have sophisticated laboratory techniques begun to answer some of the vexed questions of marble identification.” Four years later, in the January-February special issue of Archaeology dedicated to “Archaeology in the 21st Century,” George F. Bass, then president of Archaeological Institute of America, further recognized that Herz was the “first to apply his geologic knowledge to archaeological problems.” Herz’s international reputation was further enhanced where, in 1988, he was invited to be the keynote speaker at the 18th International Symposium of the International Association of Engineering Geology where the focus of the conference was on the engineering geology of ancient works, monuments and historical sites. 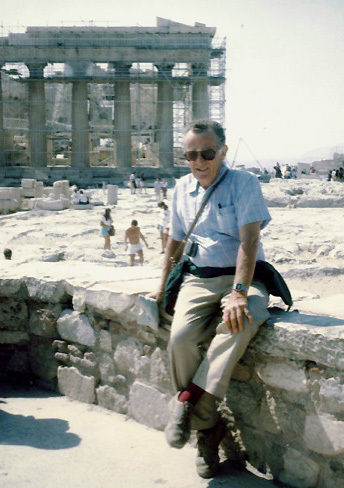 In 1995 the classical archaeology community recognized Herz’s contributions to archaeology by awarding him the prestigious Pomerance Award for Scientific Contributions to Archaeology of the Archaeological Institute of America. And in 2007, the Archaeological Division of the Geological Society of America awarded Herz the Rapp Award for Archaeological Geology. Herz will be remembered as an excellent and caring professor and mentor who provided his students with a keen sense of how geology can contribute to our understanding of the cultural past. Herz broke down many ingrained barriers in Classical archaeology that permitted aspects of the “new” archaeology to take root in the Mediterranean. ASMOISA is very much a part of Herz’s legacy. Pingback: 거란, 돌궐, 말갈의 후예들</t | ТОВ "Вент-Майстер і КО"